Lemongrass (Sa) is widely used in Vietnamese cuisine as well as other Asian cuisines. It has a clean, crisp and citrusy aroma. Lemongrass can be used in marinade for beef, pork and chicken. It also goes well with seafood. You can use lemongrass in a lot of dishes including soups and stir-fries. You can find it at Asian grocery stores. My Western grocery stores start to carry lemongrass, but the price can be higher than at Asian stores. You can freeze lemongrass so if you like to cook Asian food regularly, you can buy extra and put in the freezer. 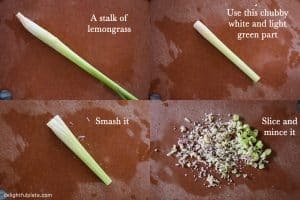 To prep lemongrass, first, peel off the 2 – 4 outer layers which are often dry. Then, cut off the bottom bulb which is 1 – 2 inch long. We want to use just the white and light-green part of the lemongrass, which is the 6-inch chubby lower end right next to the bulb. The skinny green part is tough and fibrous and doesn’t have as much aroma, so discard that part. Now, smash the chubby part because smashing will help releasing the lemongrass fragrance. If you use lemongrass in marinade or stir-fry, slice thinly and chop finely as in the photo above. If you use it in soup, just put the smashed stalk into the soup.